Thoughts? Would I have to remove the backdrop for a uth to work, should I just go heat lamp? Here's a Pic so far, keep in mind I haven't added a sec water bowl, food bowl, shells, moss pit, and need to add another 2inch of coco/plays and in etc,. It should work with a UTH, but make sure to get the largest that will fit and if it's in the budget, go with a thermostat to make sure everything stays stable. I think you may need a 35x11 to make sure there is enough even heating, but it really comes down to how warm your room is and how much the styrofoam blocks. You very well could get away with a 35x6 in some cases. Unfortunately trial and error is the only way. However, the crabs will pick apart the styrofoam. It may not be quickly, but the texture is right and they tend to zone out and squeeze squishy things to death! 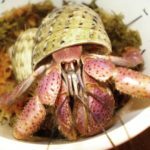 Because hermits need at least 6 inches of substrate - and even more if the crabs are larger - front opening terrariums have to be modified with a piece of glass or plexiglass across the front to hold in all that substrate. The terrariums are only 4 inches deep if I remember correctly. You can pick up sheets of plexi at any hardware store. Thanks, I ordered a 35x11 and we'll see how well it does. I have a small 75w night bulb I can always suppliment with if needed. I took a look at on the 40g version it's 5" to the opening doors, it's probably shorter on their small tanks but I'll probably ramp up the substrate an inch towards the back. I'll report back my findings once I get the ultratherm in. My store was awesome and and sent me home with a new tank and I'll return the broken one later. I have one issue, I believe I have a molting crab down below for about a week now. Can he be transplanted safely? darn! That crack from the Ultratherm heating up the tank! Did you also have the back side of the UTH insulated too? If so I'm thinking it was insulated too well. It is hard you say with your guy only being down for a week. Sometimes they just like to hide. If your pet store is cool I would probably let them know you have a molter and it may be take some time to return the bad tank. It's not like you have something they can resell, Chances are they will just get a credit for a replacement tank. Yeah the back was insulated with reflectix. I monitored it for a few weeks and it never seemed to be too hot, then last night I heard a really loud pop and the ultratherm was so darn hot. I think I'll redo the ultratherm without the backdrop this time.